All About Tattoo Safety and Hygiene. A tattoo machine works by making a puncture wound in your skin, and when it does so it injects a drop of ink into that wound. This is why tattoo safety is so important. Any wound has the potential to become infected, or to transmit diseases, so any good tattoo studio will take the safety of their clients and artists very seriously. After all, their reputation and good name are at stake with every tattoo they do. If you’re thinking about getting some ink, you want to concentrate on getting the best design and artist you can find to do it, not worry about whether tattoo safety is a priority at the studio you visit. Standard practices for tattoo safety in Bangkok? As much as we’d love to say that every tattoo studio and artist stick to the generally accepted rules of hygiene and safety, that isn’t always the case. Even one of the absolute core principles – using a new needle for every customer – isn’t universally applied. In most studios who use machines it is, however a lot of hand poked (commonly known as bamboo tattoos, because in the distant past that’s what was used), especially those done at temples, use the same stick that is just washed between uses. Would you really want to risk it? We know we wouldn’t! That isn’t to say that every studio is bad. We’ve seen great standards and terrible standards. Good knowledge and no knowledge at all. So it’s really up to you to make sure that the studio and artist you visit takes tattoo safety seriously. How we ensure tattoo safety for every customer. At ALL DAY Tattoo, we want you to be confident that everything is as safe as possible, so for everything that is possible to buy as “single use” and packed in sealed packaging in a sterile environment, we do. This includes things like: needles, tubes, ink cups, gloves, razors, machines bags and clip cord sleeves. 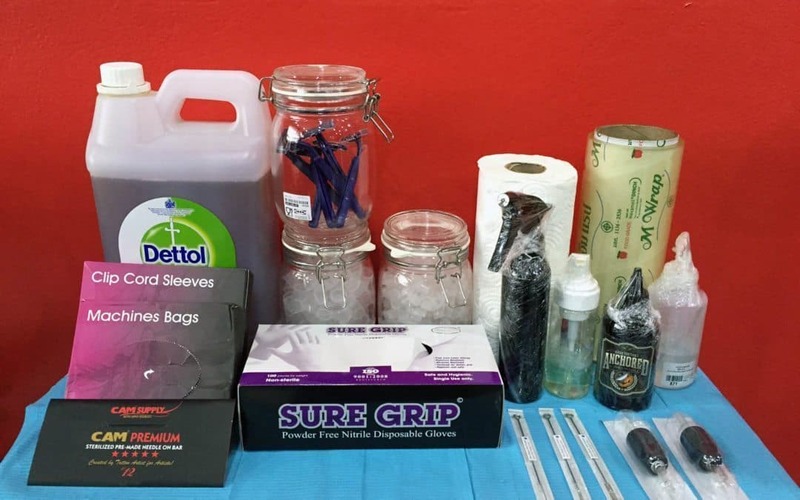 All surfaces around the tattoo stations are covered with disposable film/barriers and disinfected thoroughly with alcohol and/or Dettol before and after every use. You’ll see us opening things just before we use them for the tattoo, and you’re always welcome to ask and discuss anything that might concern you. Your artist will open our high quality needles (yes, needles have different qualities!) right in front of you, just so you have no doubt at all that they’re new and sealed. You can even ask to inspect the packaging and open it yourself, we won’t be offended! What to look out for to make sure tattoo safety is in place. Are they using new, sealed needles for every tattoo? Are the needles high quality, packed with expiry dates and imported from a reputable country for safety standards (i.e. not China!)? Does the place look and smell clean? Is garbage in bins that can be opened without being touched? Are the artists using gloves? Are the artists using clip cord sleeves and machine bags? Are they using disposable items and if not, is an autoclave available? Are the workstations/lamps/machines wrapped with some form of disposable barrier? Can someone at the studio talk to you about how they prevent contamination? Can your artist answer questions about the hygiene of the studio? If these things aren’t in place, get out of there! It isn’t worth the risk. You should keep in mind that getting a tattoo is more than just finding a good artist. You should do everything you can to make sure you’re only walking away with a beautiful new tattoo, not something extra that will be with you for just as long. Once you’ve found the right place, just relax and enjoy the process! If you follow these rules and insist on tattoo safety and hygiene before your artist starts up their machine, you’ll be fine.